Niall Currie. Pic by PressEye Ltd. 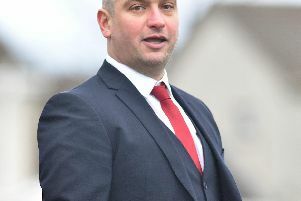 Manager Niall Currie is calling for a final flourish as relegated Portadown prepare to tackle a penultimate appearance this season in senior football. Defeat during Tuesday’s test against Ards confirmed the drop for the Ports within a troubled year but Currie wants to close out the campaign in positive form. Back-to-back home wins over Carrick Rangers and Ballinamallard United served as signs of an encouraging future as two teenagers - Luke Wilson and Ross Larkin - grabbed first goals in the Danske Bank Premiership. Fifteen-year-old Callum Ferris became the youngest scorer in the history of the Irish League’s top flight with a penalty against Ards. “The fanbase is special and the supporters proved that again with the amazing backing they gave us on Tuesday, “ said Currie. “The progress of the teenagers this season offers an exciting future. “We want to continue the positive momentum of the past few performances into the final two games. Glentoran can also point to a season of struggles but boss Gary Haveron is determined to deliver over the final two games.